Travelwheels Campervan Hire Sydney Pick up Drop off depot is located at 11 – 15 Clevedon Street, Botany, Sydney. We are very close to Sydney airport and within minutes you can be on the road to Melbourne or Brisbane missing all the traffic in Sydney! Call our friendly team on 0412766616 and Wir spechen deutsch and nous parlons Français ici! You can email us for a quote here = [email protected] or check out our low rates for Sydney Campervan Hire. Travelwheels Campervan Hire Sydney is located in the Botany area of Sydney at 11 – 15 Clevedon Street, Botany, Sydney, New South Wales, 2019. Driving Directions to travelwheels campervan hire Sydney depot. Travelwheels is located at 11 – 15 Clevedon Street, Botany, Sydney, New South Wales, 2019. If you are driving from the city, or coming from Melbourne or Brisbane then first of all you need to follow the signs for “Sydney Domestic Airport” or the Botany area of Sydney. Once you get close to Sydney’s Domestic Airport, you will need to look for Botany Road signs. From here you you need to turn off at Botany Road (not heading towards the city!). We are less than a ten minute drive away from Sydney domestic Airport. If you have a GPS or smartphone, then our address is 10-15 Clevedon Street, Botany, Sydney, NSW, 2019. If you get lost, then you can call travelwheels on 0403362086 or 0414897880 and ask for some directions! Once you are on Botany Road be on the look out for a set of traffic lights next to Hastings Street. Turn left here and travelwheels campervan hire sydney is less than 600m away. Once you turned left in to Hastings street drive for about another 350m and you will get to a “T” junction. Turn right in to Tenterden Road and then after 10m turn left into Clevedon Street. From here keep looking to the left hand side of the road. Travelwheels campervan hire sydney is now only 100m away! Very easy to get back to the city from Travelwheels Campervan Hire Sydney Depot. Just walk back along Hastings Road until you get to Botany road. Then you will see a bus stop on the left hand side of the road. From here you can catch a direct bus back to Sydney city centre for approximately $4. Toll road in Sydney and across Australia. Remember after your campervan hire sydney holiday, don’t forget to pay for any toll road charges! Australia has a very confusing system about toll roads. Here is our Toll roads in Sydney guide written by our staff at our Sydney depot you will find useful. Once you have booked your travelwheels campervan hire sydney van from our friendly staff, it’s cheap and easy to get to our base in Botany. All you have to do is take cheap public transport to travelwheels campervan hire Sydney pick up and drop off depot and it will only cost $4 per person on the bus. Next to Travelwheels campervan hire sydney depot we have a lots of local shops and facilities so that you can stock up your camper without wasting time. This way you can be ready to hit the road and start your Australian Adventure. Domestic Airport Railway Station (3.3km) from Travelwheels Campervan Hire Sydney depot. We suggest getting the bus as it is easier than the train from Sydney city centre. This is the most popular way to get to travelwheels campervans sydney depot and it’s the cheapest as well! Get on the bus in the city and ask the driver to be dropped off at “Botany Road nr Hastings Street Stop”. Grab either the 310, 309 or M20 bus from Central to go to Travelwheels Sydney depot. 4.3km from/to travelwheels campervan hire sydney depot. It takes about ten minutes to drive to the airport if there is no traffic. 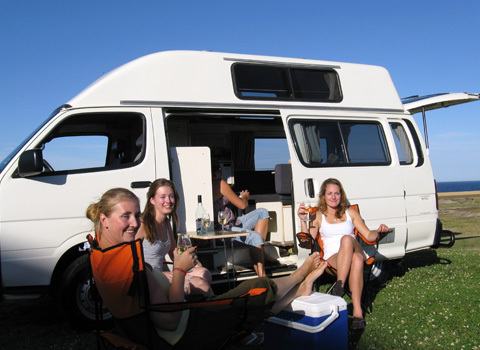 Travelwheels Campervan Hire Sydney – local shops. Travelwheels Campervan Hire Sydney has a range of local shops nearby our depot. We have two bakeries, chemists, newsagents, two pubs, restaurants, and coffee shops close by. They are all a short walking distance from our depot in Sydney. Where can I park my campervan in Sydney? We often get a lot of customers asking us where can we park the campervan if I want to spend a few days in Sydney? If you are on a super low budget, then you might want to check out the back streets and park up overnight close to a beach. Please double check signs to see if you are allowed to “stay over night”. We really like Maroubra beach. Easy to find a quiet road close by and then take the express bus into the city! Here are two options for those looking for campsites close to Sydney Lane Cove River Tourist Park is not far away from North Ryde train station. Therefore you can leave the camper here and take the train in. Here is a link to Sydney train network for ticket prices. Another option in the Northern Beaches is the BIG 4 Sydney Lakeside Holiday Park which is located at close to the very beautiful Narabeen Beach. You can camp here and enjoy this amazing beach at the same time. Used cars and campervans for sale in Sydney with Travelwheels used car sales. We specialise in selling ex-hire used campervans for sale at our Sydney depot. We make sure they are deep cleaned, all the stickers removed and ready to go on an adventure around Australia. Call Shaun on 0421101021 to ask about our ex-hire used campervans for sale.